Which PH Tycoons Are Partnering with Their Potential Disruptors? Among the many roles worn by a startup is that of a disruptor. Many startups describe their technology, products and/or services as disruptive of incumbent industry players. They are changing the game by offering an innovative solution that is more efficient than the current established options. Such disruption has affected many large traditional companies that have failed to innovate alongside the changing market. The threat of being disrupted is therefore in the minds of many CEOs today as they make sure that their companies are ready for the disruptive technology brought about by these startups. But for these Philippine tycoons, how they’re addressing that threat seems to be by partnering with the disruptors themselves. In the recently released 2017 Philippine Startup Survey, the first-ever report to profile the country’s startup ecosystem, auditing firm Pricewaterhousecoopers highlighted several partnerships and alliances between large conglomerates, many of which belong to the country’s richest businessmen, and disruptive startups both local and multinational. 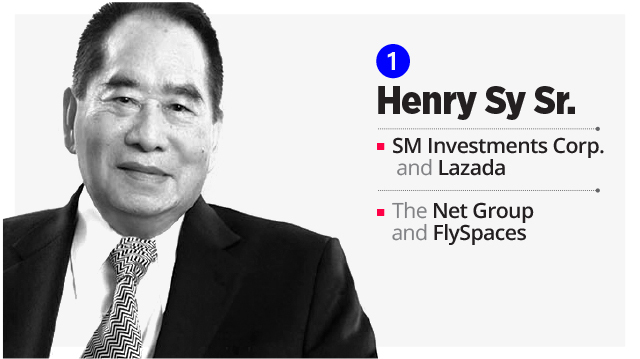 Here are five of the Philippines’ richest tycoons behind the big businesses that are partnering with these disruptors. The country’s richest man is behind SM Investments, which runs the Philippines’ largest network of brick-and-mortar shopping malls. In 2016, it established a partnership with e-commerce platform Lazada to sell SM products online. This October, Lazada brought SM’s signature three-day sales online, offering products from The SM Store at discounted prices. Apart from retail, Sy’s conglomerate is also looking into innovations in the property sector. Last August, The Net Group, an office developer SM acquired in 2013, led a funding round worth $2.1 million for FlySpaces, a real estate startup that operates a marketplace for co-working spaces. Its database of flexible offices goes beyond the Philippines as it contains listings in Singapore, Hong Kong, Malaysia and more. 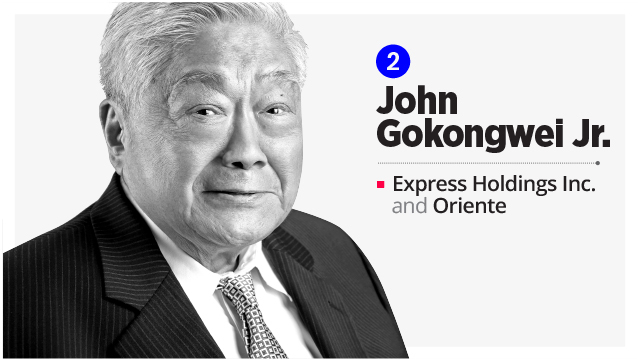 Gokongwei’s JG Summit Holdings recently announced that one of its subsidiaries, Express Holdings Inc., formed a joint venture with Hong Kong-based fintech startup Oriente. Called Oriente-Express, the partnership aims to offer peer-to-peer lending and other financial services to the country’s large unbanked population. 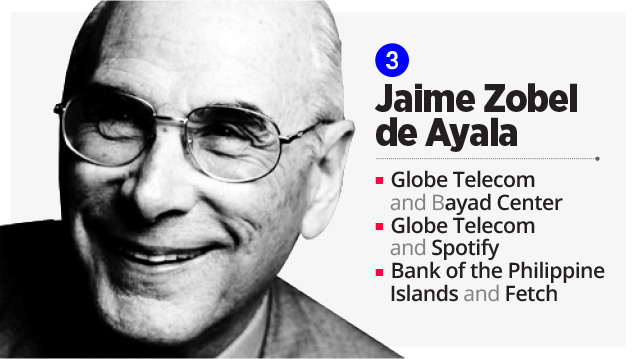 Many of the Ayala Group’s ventures into the startup ecosystem are under its telecommunications business Globe Telecom. PwC’s report lists Globe’s partnership with payment gateway Bayad Center and international music platform Spotify as examples of strategic collaborations between big companies and startups. But one other collaboration in the report involves Ayala’s banking unit, the Bank of the Philippine Islands (BPI), and its collaboration with parking startup Fetch. The BGC valet service has a Php5-million insurance coverage from BPI/MS Insurance Corp. should anything happen to the vehicles it handles. 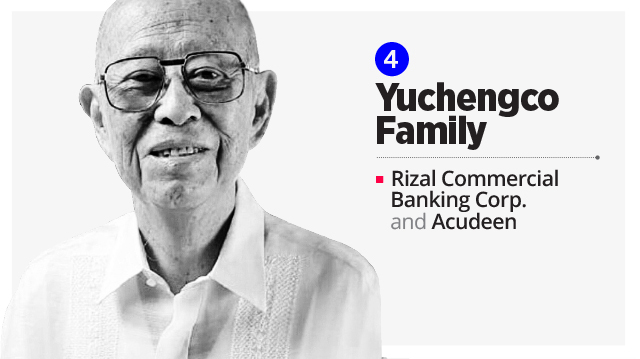 The largest member of the Yuchengco Group of Companies, universal bank Rizal Commercial Banking Corp. (RCBC), is one of the partners of fintech startup Acudeen. Through subsidiary Rizal Micro Bank, RCBC inked a $6-million deal with Acudeen last June to finance the invoices that Acudeen processes. Founded in 2016, Acudeen helps fellow SMEs by providing a platform to quickly turn their receivables into cash. It has since received global recognition, including winning $500,000 from the Seedstars World competition in Switzerland. Pangilinan’s PLDT Inc. is one of the country’s most active conglomerates in the startup world. In PwC’s list, the telecommunications firm is the only company that has a presence in both the big business side and in the disruptor side. 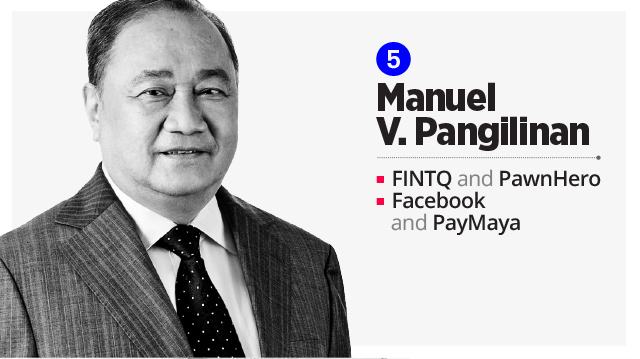 In the big business side, PLDT announced earlier this year that FINTQ, its fintech subsidiary, partnered with PawnHero, the country’s first online pawnshop. The partnership integrated PawnHero into Lendr, FINTQ’s lending solution. In the disruptor’s side, the PwC report noted many partnerships inked by PLDT’s mobile wallet unit PayMaya. One of these partnerships is with Facebook, which started offering financial services such as money transfer and bills payment on the social media giant’s Messenger platform in September. entrepph FINTQ Manny Pangilinan Manuel V. Pangilinan MVP PawnHero PayMaya PayMaya Philippines PLDT smart Smart Communications, Inc.
How Much Money Are College Entrance Exam Review Centers Making?